Multiple factors play a role in selecting a hair transplant candidate and planning the hair loss treatment, including the classification on the Norwood-Hamilton Scale to rate the degree of hair loss as well as the evaluation of donor hair for colour, curl, texture and density. 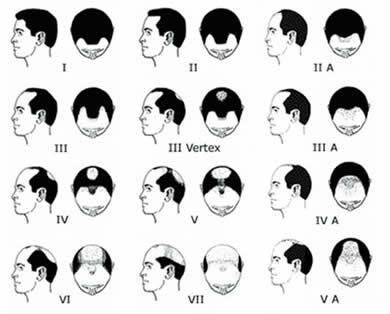 A number of people for whom hair transplantation is less appropriate, do not have sufficient donor hair to correct a large bald area on their head. However some of those people may undergo limited hair transplantation to cosmetically strategic zones such as their hairline. The candidate must be carefully assessed as to the cause of hair loss (alopecia), the family history, and whether hair loss has stabilized or is likely to continue to progress. If hair loss is just beginning or rapidly progressing, great care must be taken to avoid designing a hair line that is too far forward without adequate donor hair to cover future bald areas. It also has been used successfully on persons who have lost some but not all hair as a result of burns or other injuries to their scalp. In addition, since the hair transplantation processoften requires a number of procedures and may be spread out over several years, it is important for both the candidate and the dermatologic surgeon to feel they can work well together for an extended period of time.